Summary: Electrical Circuits Name : Bruno G Question: I was wondering if the refrigerator needs to be on its own circuit or can have other outlets with it. I was wondering if the refrigerator needs to be on its own circuit or can have other outlets with it. It seems a waste to use a whole circuit on a refrigerator. It probably does not use that much power. 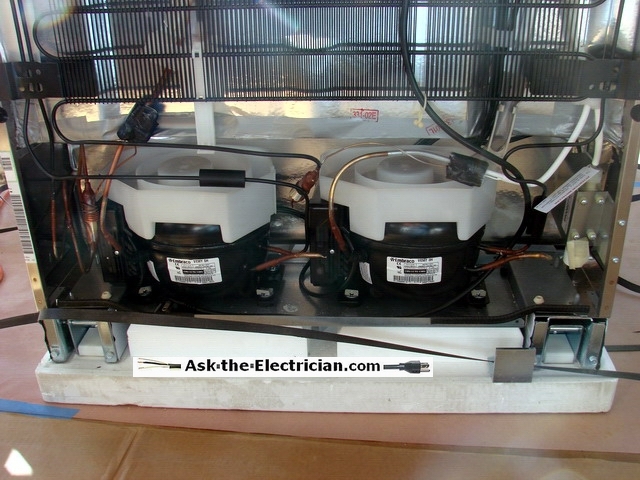 Hi Bruno - Great Electrical Repair Question! Yes the refrigerator is required to be on its own 15 amp circuit when building a new home or performing a kitchen remodel. I understand what you are saying and if you have an existing 20 amp circuit and a low energy consuming refrigerator I can see where you would be very tempted to share this circuit, but it really should not be done. In older homes i'm sure you will find that there are fewer kitchen circuits and that many of them are shared, but that was common years ago. Today we find our kitchens stocked with higher energy consuming appliances so this is why upgrading the wiring to today's requirements is a good practice to follow, besides it will increase your home value and make your kitchen equipped to serve you better. The most important benefit of upgrading kitchen wiring is having the outlets that are GFCI protected to reduce the chance of electric shock.